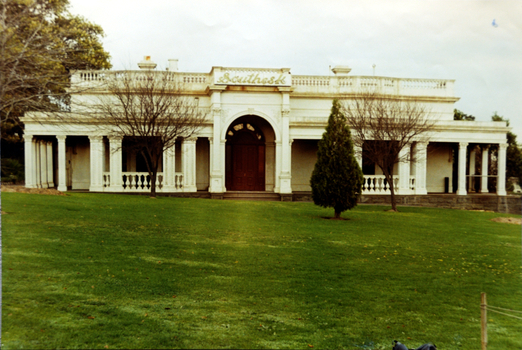 Founded in 1958, the Kew Historical Society is one of the oldest suburban historical societies in Melbourne. 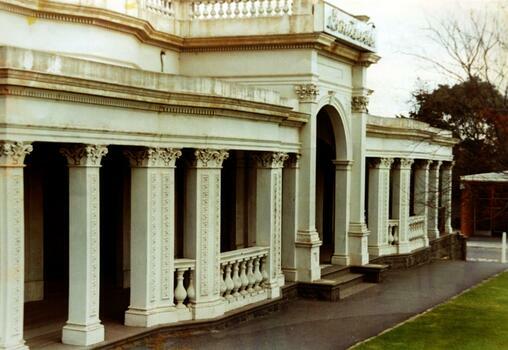 The Society was formed to assist in the preparations for Kew’s 100th Anniversary in 1960. 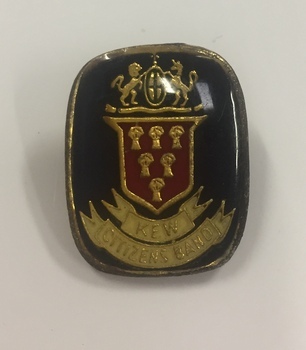 Today, the Society continues to work with local government and other organisations within Kew to stimulate interest in our history and heritage. It publishes, in print and online, information and resources about Kew’s history, as well as organising events relevant to our heritage. 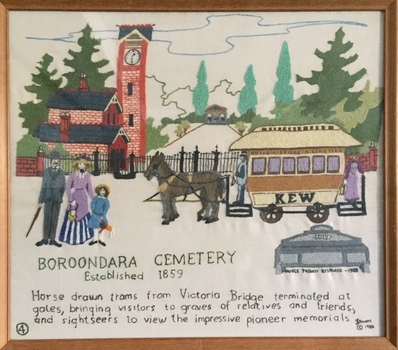 The Society cooperates with other historical societies and groups across the City of Boroondara through the Boroondara Historical Societies Association. Fridays & Saturdays 11.00am to 1.00pm. Closed in January. 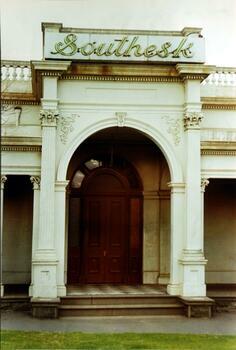 The Kew Historical Society was founded in 1958, and the collection predates and postdates that year. 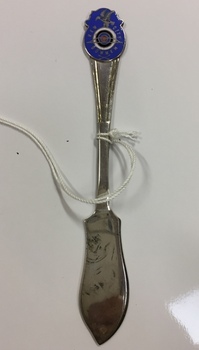 The collection has sometimes grown gradually, or significantly, the latter through key donations (eg The Rogers Collection), or due to events such as the amalgamation of the former City of Kew into the new City of Boroondara in 1994. 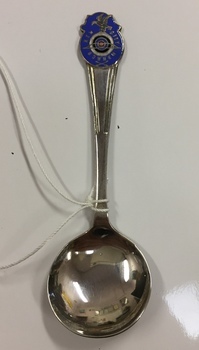 Many ‘civic’ items were donated before, during or after the amalgamation. These records are digitised by the Kew Historical Society on Victorian Collections for the purposes of education and preservation. If you believe that we have infringed your copyright please contact us and we will remove the material from the site. The collection as a whole fulfills the criteria for very strong historical, aesthetic and research significance at a local level. It also has many outstanding associations with state themes, figures and events and quite a few that resonate at a national level. The costume and textiles, map and picture collections each have very strong historical, research and aesthetic significance of their own accord. The degree of their significance is greatly enhanced by all of the comparative criteria: interpretive value, provenance, condition, integrity, rarity and representativeness. The costume collection has a very high degree of aesthetic significance for its beauty, quality and workmanship. There are some items that are associated with nationally significant designers, or with Kew donors who have made an impact on society at a local and a state level (ie Prue Acton, Jinoel of Melbourne, Oggi Fashion House). 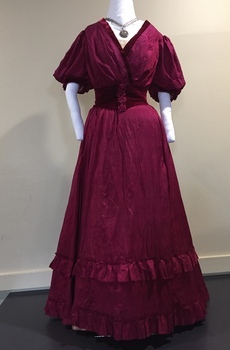 The strong degree of provenance and high quality of the design and dressmaking that went into the production of these clothes strengthens the research significance of this sub-collection for those interested in fashion, textiles and dressmaking. 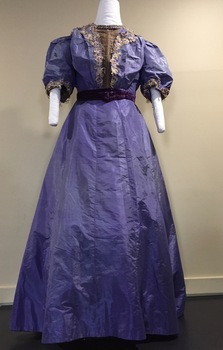 This costume collection includes items that date back to the 1850s (patchwork Denbigh quilt) through to the 1980s, and that reflect changing styles, technologies, textiles and production methods. The picture collection has some items that have high local significance such as the Josiah Barnes photograph ‘Kew proclaimed a city’, which was taken on that day – 10 March 1921, and the ‘Unveiling of the Kew War Memorial’ on August 30 1925 in front of an audience of over 5,000 people and presided over by the Kew Mayor and the Governor of Victoria. Both of these important images also have significance to state and national processes of municipal development and memorializing war. The mayoral portraits (part of the picture collection) have a very high degree of historical and research significance for their associations, enhanced by strong provenance and technical qualities. Eminent photographers took many of the portraits and the subjects are people who have made a significant contribution to the welfare and development of Kew and, in the case of some of the Mayors in this collection, of the state or even the nation. This includes people such as Stanley Argyle (Premier of Victoria 1932-35) and William Kerr (influential businessman and federal government advisor in the early decades of the 20th century). The significance threshold of this sub-collection is therefore likely to be of state significance at the least. The maps and plans number some 300 or more and include some fascinating and important maps beyond the MMBW sub-collection that, itself, holds some unique items and has been discussed at length in this report. Other much earlier and hand drawn maps such as ‘Back to Kew’ (c.1875) and ‘Site of the first house in Kew Central’ (undated) are historically fascinating. In the case of ‘Back to Kew’ it is the detail of the built, natural and social landscape of Kew, which was also annotated and added to several times in subsequent decades to show the development of the area. In the case of ‘Site of the first house in Kew Central’ it is the careful recording of the garden layout and the nature of domesticity in these early days of European settlement that is both fascinating and rare to find in any local history collection. While not all the items are original the map and plan collection has a very high degree of historical and research significance. Provenance for much of the collection is strong, and therefore supportive of its historical, research and interpretive value. Certainly the interpretive capacity for understanding a detailed and nuanced history of Kew on many levels, as well as touching or reflecting on wider stories on a state or national stage is very high. Amazing hat collection, these are a great addition to the site - Site admin. 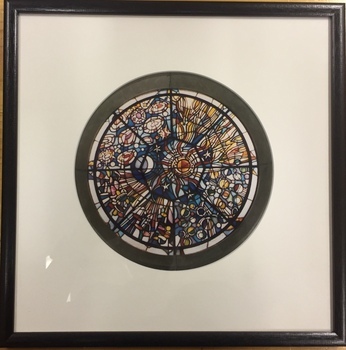 Photograph of the original design by the artist Alan Sumner for his window, The Four Seasons. The window, now in Kew Library was purchased to commemorate Kew's 125th Anniversary. An article in a contemporary issue of Kewriosity states: The window is approximately three metres in diameter and divided into one central and four outer panels. Clockwise from the top is Autumn with sinuous lines in yellow and brown, then winter in cool blues and mauves with lines and circles suggesting rain, snow and hail. Spring follows in the bottom left quadrant with organic ovaloid shapes richly coloured and lines evoking growth. Then to the top where summer explodes with the colours of fire and blue of the sky at the height of summer. 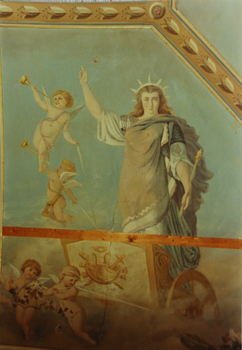 The centre panel has a powerful image of sun, moon and stars which links the surrounding panels". 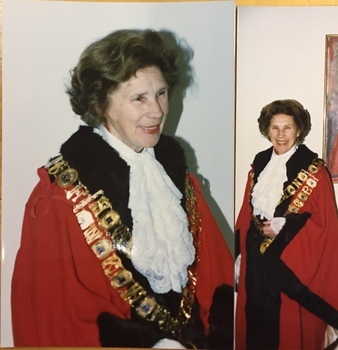 The photograph of the window was presented to Cr Jill O'Brien, Mayor of Kew in 1983-4, who was instrumental in the purchase of the window. The same Kewriosity article, referred to in the physical description, states that the window was originally commissioned from the artist by a Kew timber merchant, and following ownership by successive owners found its way back to Kew. 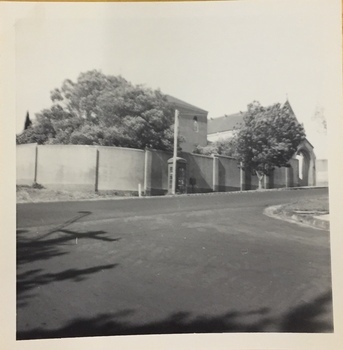 The framed photograph is part of the Jill O'Brien collection which was gifted to the Kew Historical Society following her death in July 2016. 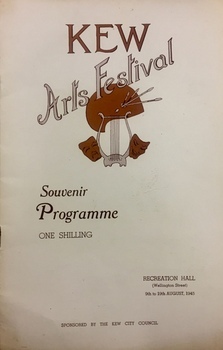 The collection includes important primary sources relating to a number of areas in which Jill O'Brien made a significant contribution including the establishment of the Villa Alba Museum, local government, the Kew Historical Society, the Yarra Bend Trust, and the arts. 3. 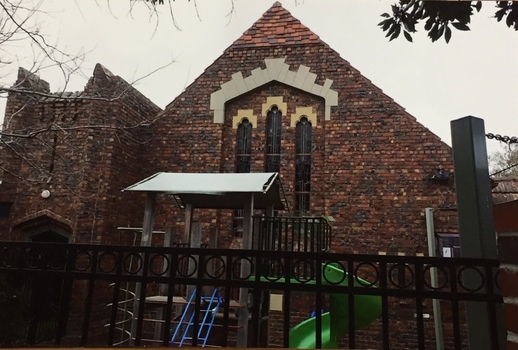 East Kew State School. A framed embroidery created by adults and children of the City of Kew as a Bicentennial project, based on a design by the artist Joy Stewart. Five of the six completed embroideries created in the project are/were displayed in the Kew Library. 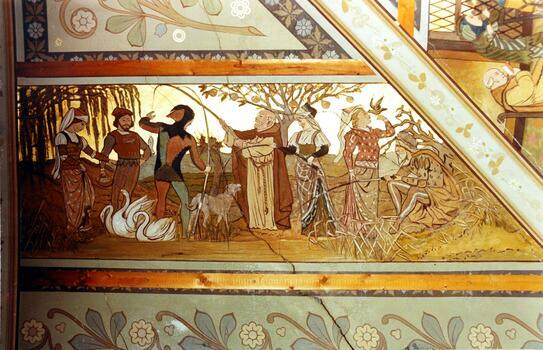 [The five embroidered panels have now been temporarily removed for conservation reasons]. Joy Stewart was born in Melbourne 1925. She studied at Swinburne Technical College Art School from 1941-1945, then the National Gallery Art School 1946-1948. Her career included employment positions as a display artist, designer/painter, gallery assistant, and art teacher. Joy relocated to Cairns in 1981. Solo exhibitions in Melbourne and Cairns, including 'Done By Me' at Cairns Regional Gallery in 1999. Group exhibitions at Cairns Regional Gallery, 'The Fish John West Regrets, 1993' and 'Facets of Life' 1994. 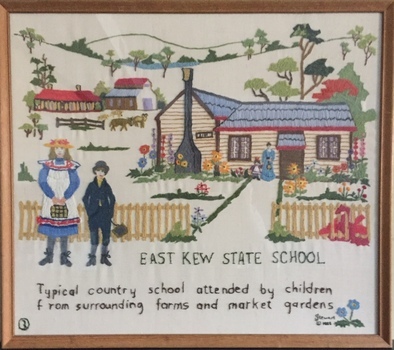 Inscription: "EAST KEW STATE SCHOOL / Typical country school attended by children from surrounding farms and market gardens." Embroidered signature of the artist: "(c) JStewart, 1988"
8. Kew. City of Parks and Gardens. A framed embroidery created by adults and children of the City of Kew as a Bicentennial project, based on a design by the artist Joy Stewart. Five of the six completed embroideries created in the project are/were displayed in the Kew Library. 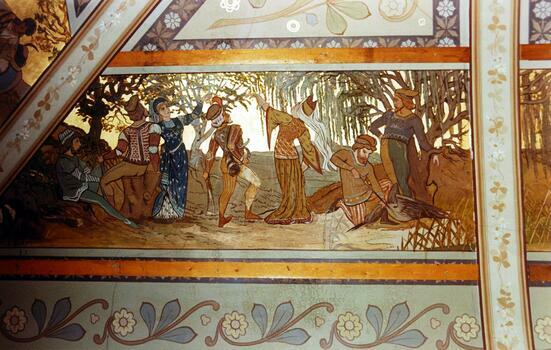 [The five embroidered panels have now been temporarily removed for conservation reasons]. Inscription: "KEW: City of Parks and Gardens / Proclaimed a Municipality December 1860 / Created a Borough 1st October 1863 / Gazetted a Town 14th December 1910 / Declared a City 9th March 1921." Embroidered signature of the artist: "(c) JStewart, 1988"
1. Turinville. A framed embroidery created by adults and children of the City of Kew as a Bicentennial project, based on a design by the artist Joy Stewart. Five of the six completed embroideries created in the project are/were displayed in the Kew Library. 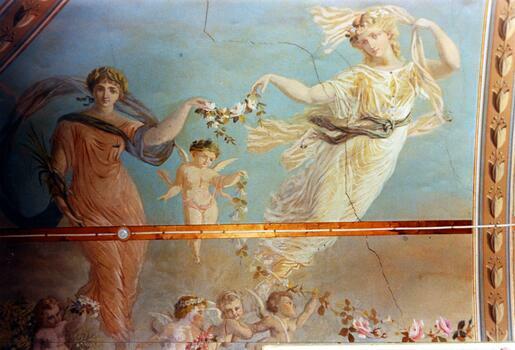 [The five embroidered panels have now been temporarily removed for conservation reasons]. Inscription: "TURINVILLE / Early country residence overlooking the Yarra River. 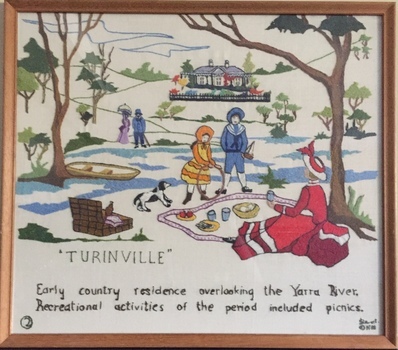 Recreational activities of the period included picnics" Embroidered signature of the artist: "(c) JStewart, 1988"
1. Survey Team. A framed embroidery created by adults and children of the City of Kew as a Bicentennial project, based on a design by the artist Joy Stewart. Five of the six completed embroideries created in the project are/were displayed in the Kew Library. 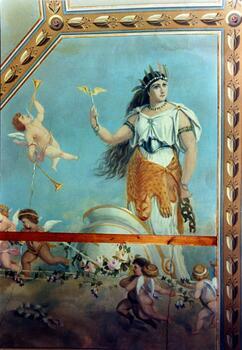 [The five embroidered panels have now been temporarily removed for conservation reasons]. 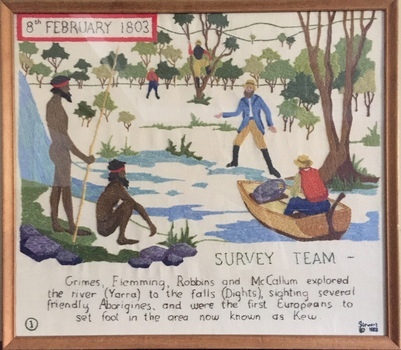 Inscription: "SURVEY TEAM 8th February 1803 / Grimes, Flemming, Robbins and McCallum explored the river (Yarra) to the falls (Dights), sighting several friendly Aborigines, and were the first Europeans to set foot in the area now known as Kew." Embroidered signature of the artist: "(c) JStewart, 1988"
4. 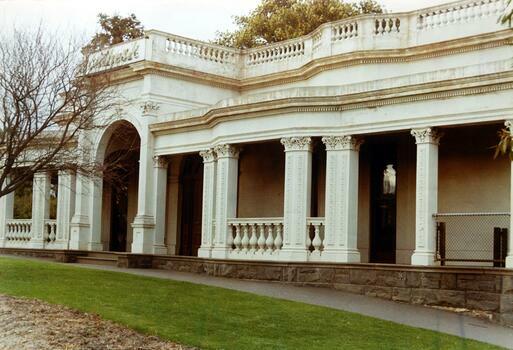 Boroondara Cemetery, established 1859. 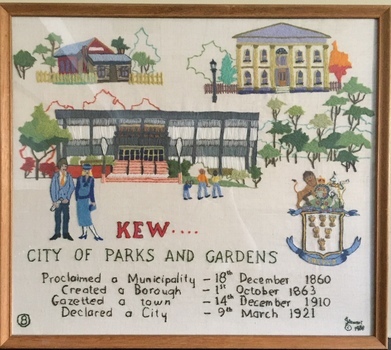 A framed embroidery created by adults and children of the City of Kew as a Bicentennial project, based on a design by the artist Joy Stewart. Five of the six completed embroideries created in the project are/were displayed in the Kew Library. 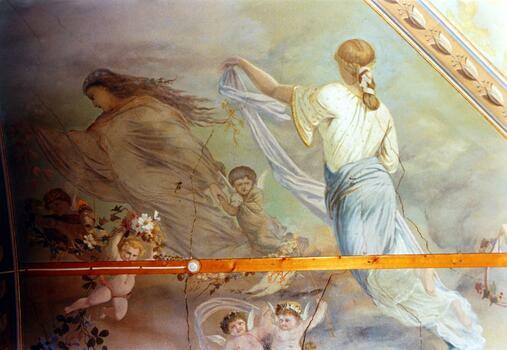 [The five embroidered panels have now been temporarily removed for conservation reasons]. Inscription: "BOROONDARA CEMETERY / Established 1859. Horse drawn trams from Victoria Bridge terminated at gates, bringing visitors to the graves of relatives and friends, and sightseers to view the impressive pioneer memorials." 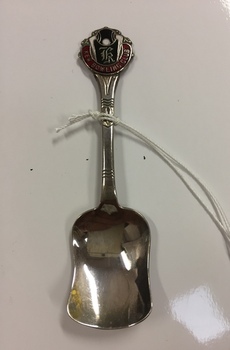 Embroidered signature of the artist: "(c) JStewart, 1988"
A shovel shaped sugar spoon with an enamelled badge attached to the end of the handle consisting of a black bowl with a white dot above a black bib with an old English K with Kew Bowling Club on a red curved band below. 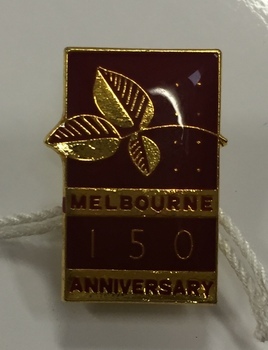 Melbourne 150 Anniversary silver plated pin with a brown enamelled rectangle. 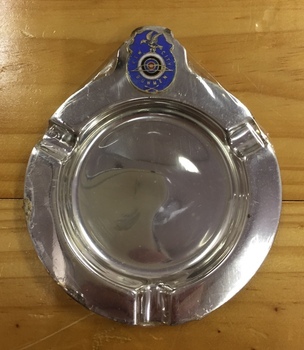 A round plated metal dish with 3 equally spaced indentations for cigarettes and a Kew City Bowmen enamelled badge attached. 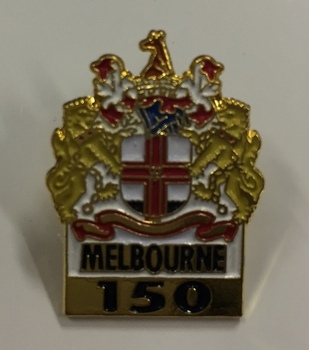 The badge has a flapping bird standing on a four ringed target enamelled in white, navy blue, green and red rings, a bow superimposed surrounded by Kew City Bowman with 2 crossed arrows below on a mauve blue background.